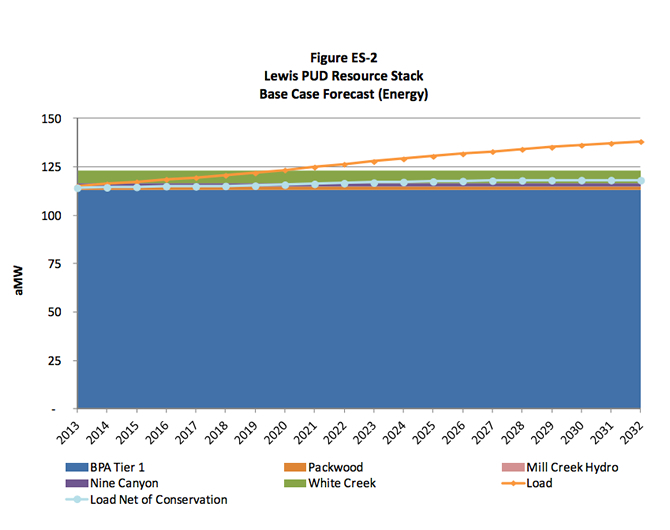 Lewis County PUD has complete development of its 2016 Integrated Resource Plan (IRP) as required by state law, RCW 19.280 and is posted on this site. The 2016 IRP outlines the sources of power needed to supply our customers through 2026. It describes the mix of resources from generation, conservation and efficiency that will meet current and projected needs at the lowest reasonable cost and risk to the utility and its customer-owners. RCW 19.280.030 Development of a resource plan — Requirements of a resource plan. (1) Utilities with more than twenty-five thousand customers that are not full requirements customers shall develop or update an integrated resource plan by September 1, 2008. At a minimum, progress reports reflecting changing conditions and the progress of the integrated resource plan must be produced every two years thereafter. An updated integrated resource plan must be developed at least every four years subsequent to the 2008 integrated resource plan. The integrated resource plan, at a minimum, must include….please refer to RCW 19.280.030.